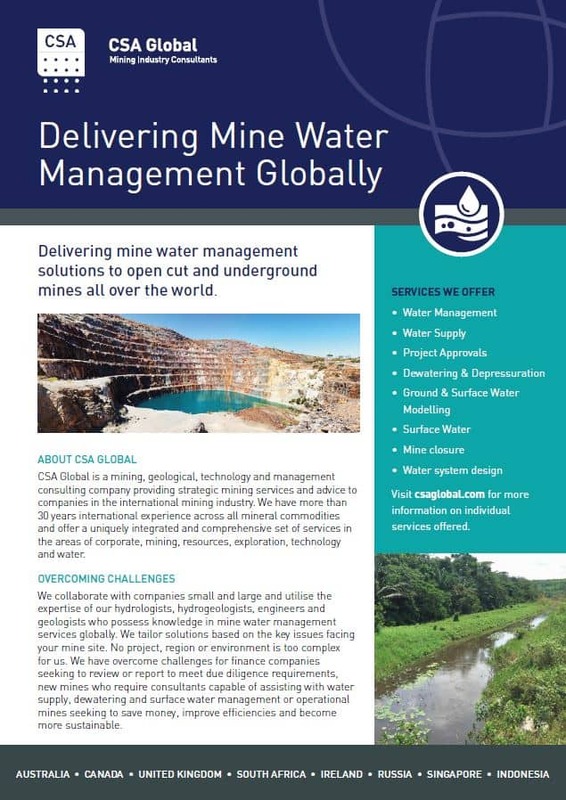 CSA Global is pleased to launch its latest capability statement on mine water management services; helping to deliver solutions to open cut and underground mines all over the world. Our team based in Dublin, Ireland comprising of Principal Hydrogeologist, Paul Heaney, will lead the delivery and growth of the mine water management services now on offer. Joining Paul is Principal Hydrogeologist, Philippa Heaney and Senior Water Engineer, Kevin Sheehy. Philippa has worked on projects across Australia, New Zealand, Europe, Africa and in the Middle East and is an experienced hydrogeologist with more than 25 years’ experience in groundwater assessment, mine water management and due diligence reviews. Kevin has worked for the resources sectors for more than 12 years and possesses a great depth of mining related experience across surface water management infrastructure design, dewatering system design and water supply. CSA Global is a mining, geological, technology and management consulting company providing strategic mining services and advice to companies in the international mining industry. We have more than 30 years international experience across all mineral commodities and offer a uniquely integrated and comprehensive set of services in the areas of corporate, mining, resources, exploration, technology and water. Email us at info@csaglobal.com for assistance on your next project.